Jim McNalis sits in his condo in Fort Lauderdale and remembers his meeting with Aung San Suu Kyi at her house in Rangoon. Aung San Suu Kyi, as you probably know, is the woman who for more than two decades has bravely opposed Myanmar’s military dictatorship. For most of that time she has been kept under house arrest. In 1991 she was awarded the Nobel Peace Prize; and, in April, she was elected to her nation’s Parliament. 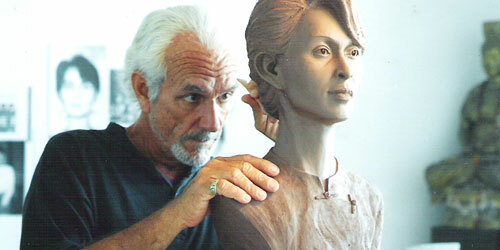 Jim McNalis is a South Florida sculptor who was once senior art director at Walt Disney World. His fascination with Burma, as he calls it (Myanmar is the name given the country by its current rulers), goes back to 1989, when he visited a Burmese refugee camp in Thailand. Nine years later he entered the country for the first time. The trip inspired McNalis to do a sculpture titled The Face of Burma. “I get ideas from my travels,” he says, “and that energy feeds my sculptures.” At first he had no particular face in mind, but the more he talked to Burmese living in Asia and in Florida (there is a sizable community in Deerfield Beach), the more the name Aung San Suu Kyi came up. McNalis kept returning to Burma, and twice – in 2000 and 2003 – he was scheduled to meet with Suu Kyi. But both times she was arrested before a meeting could take place. In 2007, he was denied a visa. No reason was given, though McNalis suspects it was because of some caricatures he had done of the generals. Unable to see the Burmese in Burma, he worked with those who had fled to Thailand. On his now annual visits, he gave sculpture lessons to refugee artists in camps along the border; he also worked with children in the refugee schools. A few months back, while in northern Thailand, McNalis received an e-mail from Aung San Suu Kyi’s Appointments Secretary saying that she would be happy to meet with him at 10:30 a.m. on Dec. 28th. The date was Dec. 20th. Eighteen days earlier she had met with Hillary Clinton. At the much-photographed gate, he was led right in. Nobody frisked him, or even checked his bag. Inside he was served tea and cake. “It was like visiting an old friend,” he says of finally meeting the woman he had sculpted, admired, and followed news of for years. “We just got down to it – no cliches, no small talk. It was such a pleasure to talk to someone so well-educated, just bursting with enthusiasm for what she’s doing. “This is a really strong, determined individual who knows exactly what she believes in. She’s nobody’s pawn. She’s given up everything – her husband, her family. Nobody’s going to push her around. And if all goes well in 2012, McNalis will return to Rangoon and present Aung San Suu Kyi with the sculpture he did of her in 1998.